Dr. Alexander (Sandy) Kunej (pronounced Koo'nay) graduated from the University of Waterloo in 1991, with his Honours Bachelor of Science Degree specializing in Kinesiology. That same year, he was accepted into the Canadian Memorial Chiropractic College, graduating in 1995 with his Doctor of Chiropractic. He also completed a one year post graduate program focusing on chiropractic care for infants, children and expectant mothers. In the process, becoming a Fellow of the International Chiropractic Pediatrics Association (FICPA). Dr. Sandy has always participated and had a keen interest in sports and athletics. In the summer of 1999, he was honoured to be part of the health team for the XIII Pan American Games in Winnipeg, Manitoba. In June 2000, he was a chiropractor at the International Children's Game held in Hamilton, Ontario. It was during this time that he realized the impact chiropractic can have on performance enhancement for athletes. He also wrote the article "Performance Enhancement Through Chiropractic" published in The Natural Healer Health Magazine. In 2010 he was the team chiropractor for the Brantford Galaxy when they won the Canadian Soccer League Championship. 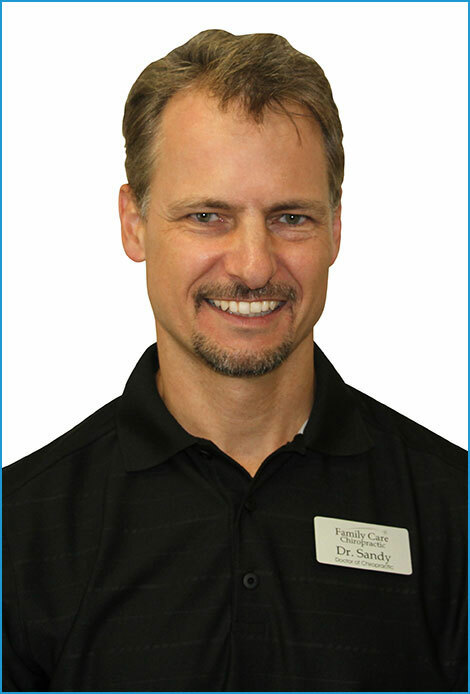 Dr. Sandy has a successful and well respected practice, Family Care Chiropractic, established in 1996. He focuses on care for people of all ages who want to release their inborn healing power, realizing and optimizing their true potential in life, naturally! Dr. Sandy resides in Brantford with his wife, dentist Dr. Heidi Kurtz, their two sons, Noah and Markus, and their daughter Erika.